Definitely giving this one a try. I looks tasty. It’s what I made for dinner tonight. One thing everyone (except Bean, natch) will eat. So easy and so yummy. The ricotta is the secret. i so agree with you! buying premade meatballs is just gross. 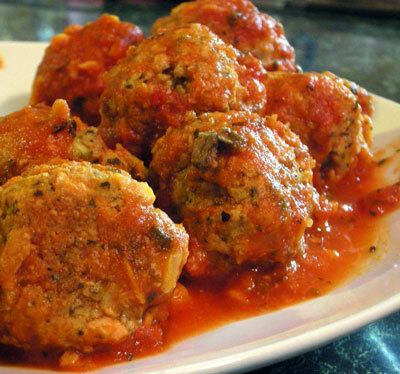 i love making my own meatballs too! these look so good! Is this Fabio’s recipe? I put a video of his meatballs on Jeff’s FB. We made them, and they are AWESOME. It looks very similar to this one. It wasn’t meant to be, but I can see it’s almost the same! Cool.